Any change in the usual chorus of bush sounds is worth investigating. One Spring morning I heard the birds making a huge fuss in the undergrowth. I thought "predator" ... and was right! This rather large snake was being yelled at by a variety of birds. Superb Fairy-wrens, Brown Thornbills, Grey Fantails, and White-browed Scrubwrens were all getting very upset, but it was the Scrubwrens that were clearly the most distressed. 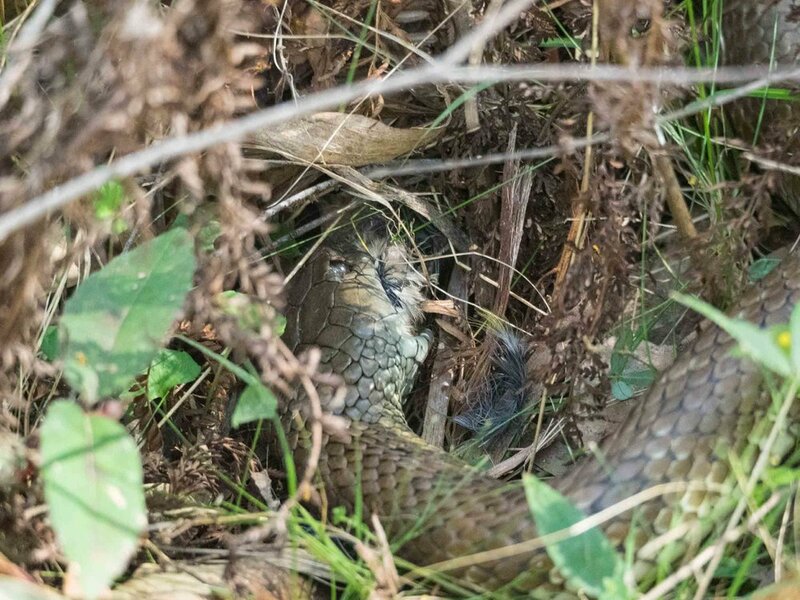 I quickly realised what was happening: the snake had discovered a Scrubwren nest. 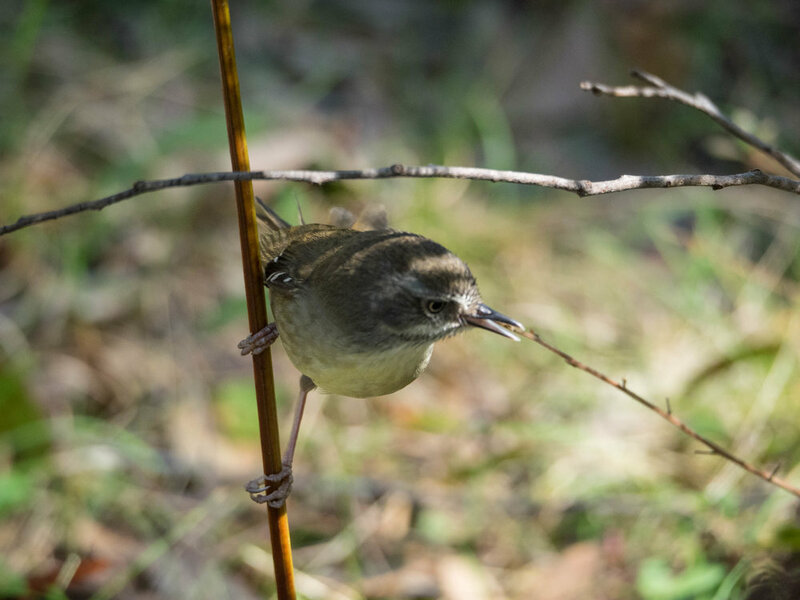 White-browed Scrubwrens nest at ground level. The nest is a feather-lined dome of dead grasses and bark, with a side entrance. It is typically hidden among living grasses, ferns or other ground cover. Although this seems a risky breeding strategy, it must be reasonably successful - the species is quite common and widespread. Anyway, as I keenly (and carefully!) looked on, the snake headed into the nest, writhed about a bit, and then backed out - with a mouthful of chick! I was quite close, camera in hand. The snake was clearly keeping an eye on me, but I figured that while ever it had a mouthful I was safe. And what a rare opportunity to witness and photograph such an event. "Nature, red in tooth and claw" indeed! It was amazing to see the flexibility of the snake's jaw as it manipulated its prey and then swallowed it, head first. The two halves of a snake's lower jaw are separate at the front and are also extremely flexible at the back of the skull. After swallowing the chick, the snake looked my way and gave me a very good view of this anatomical specialty. Looks quite comical, really. Unless you're a Scrubwren, of course. One chick down and the snake paused, watched me for a moment, and then seemed to decide I was not a threat. That's my anthropomorphic interpretation anyway. Whatever it was reacting to, it then headed back into the nest and repeated the process. And then again! While it was busily consuming the third chick I decided to leave it in peace (and the parent birds in mourning), and eagerly headed back to the house to download the images. I initially assumed that the feasting snake was an Eastern Brown Snake (Pseudonaja textilis). However, after a close look at the pattern of scales around the head, and comparison with other snake photos that we have taken on the block, I concluded it was actually a Tiger Snake (Notechis scutatus). In addition, Eastern Brown snakes have a distinct orange iris. The two species can easily be confused as the colour of Tiger Snakes is highly variable. Some - like the one seen raiding the Scrubwrens' nest - have no apparent stripes at all, while some Eastern Browns have bands. It makes identification a bit tricky for us, as both species are resident on the block. The colours are suggestive of this being a Tiger snake, but it is the broad head that is most convincing. The first section of the body is unbanded. As the rest of the body comes into view, however, the yellowish stripes are obvious. The narrow head is quite square when viewed from the front. The scales around the nostril show a different pattern to those seen on the Tiger Snake. The same animal, now watching me. Note the obvious orange iris, characteristic of this species. We can be confident that the Eastern Browns breed here - we discovered this dead juvenile after heavy rains. Particularly stripey babies such as this one are apparently quite common among the most eastern populations of the species. 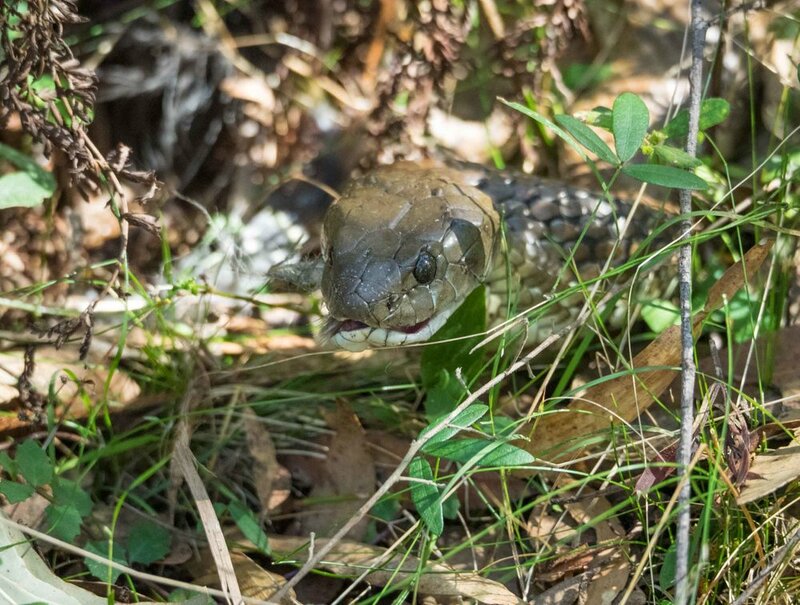 Although both Tiger Snakes and Eastern Brown Snakes are highly venomous and have a rather fearsome reputation, living among them does not worry us. We have to be 'lucky' to actually see them, as they typically move well away whenever they sense our approach. It is reassuring, however, that the house is totally snake proof. Even I wouldn't care to discover one hiding in the wardrobe. Both species are diurnal and are most active in the warmer months. No doubt they live here year-round, spending the colder months underground in a semi-dormant state. Snakes apparently don't fully hibernate, and may emerge on warm days at any time of year. Most of our sightings have been made in Spring, but occasionally we do see a snake during Winter. And it is actually during the colder months that we need to take the most care when wandering about the bush. Any snakes out-and-about then are sluggish and are therefore less likely to move away as we approach. Again, this fits with our observation that most of our 'best' sightings have been made in Spring, before the snakes are fully active. We rarely see a snake in the heat of Summer.